With Ring Spotlight Cam Wired get non-stop security and non-stop power, a motion-activated security camera with two-way audio, LED spotlights and a siren alarm. 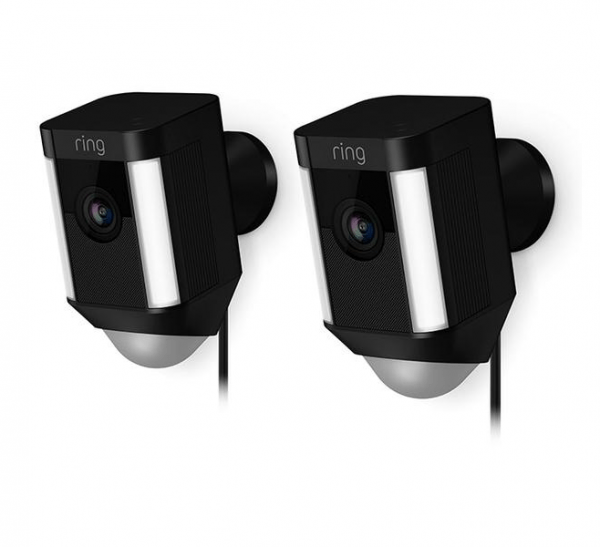 Armed with 1080HD video, custom motion zones and simple plug-and-play installation, Ring Cam Wired adds smart security to every corner of your home. Ring Cam Wired lets you create and customize your own motion zones, so you can focus on the most important areas of your home. When anyone steps on your property and triggers your motion sensors, you’ll get an instant alert on your phone, tablet and PC. Answer the alert and you can see, hear and speak to people on your property from anywhere. Ring also lets you check-in on your property at any time with Live View, so you can get streaming video and audio right at your fingertips. Its built-in night vision and LED spotlights allow you to protect your home around the clock and get high-quality HD video in any setting. And if you catch a suspicious person at your home, you can sound the 110dB alarm to scare them away. 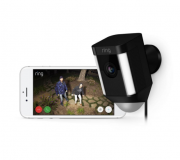 Ring Cam Wired plugs into standard power outlets, so you’ll never have to worry about charging a battery and it comes with everything you need to get your camera setup in just a few minutes. With your purchase, you’ll also get a free 30-day trial of Ring Video Recording, so you can review, save and share all your videos at any time. – 4.96 in. x 2.72 in. x 2.99 in.